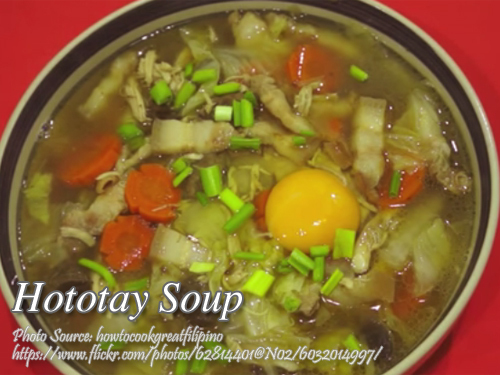 Hototay is actually a Chinese egg drop soup that consists of meat and vegetables. It is a rich soup that is composed of pork, chicken and liver. It is an all-in-one meal that is perfect for rainy days or you can also eat it with rice as a viand. There are various ways to make chicken stock and I recommend boiling the chicken with black peppercorns, onions, carrots and a little salt. You can use the boiled chicken on the hototay recipe below and also the chicken stock of course. Cooking this dish is very easy and ingredients are always available in wet markets or supermarkets. Just in case you can’t find fresh Shiitake mushrooms, you can use dried Chinese mushrooms (Shiitake or woodear fungus) by soaking it in hot water for a few minutes. Broccoli is an alternative in case you can’t really find mushrooms. In a medium size pot or wok, heat oil and saute garlic until fragrant. Next, add the onions and saute until soft. Then add the pork and saute for about 6 to 7 minutes until slightly brown. Add the pork liver and mix for a few seconds then pour a cup of water. Cover and simmer for a few minutes until the water is reduced to half a cup. Then add the shredded chicken, carrots and mushrooms. Mix the ingredients then add salt and pepper to taste. Pour the chicken stock. Bring to a boil and simmer for about 3 minutes. Then add the pechay Baguio, stir and simmer for 1 to 2 minutes. When cooked, transfer to individual bowls depending on how many people you are going to serve. Get some eggs and crack each egg in a small bowl before pouring it on the hototay soup. Don't crack the egg directly on the soup to avoid wasting it in case the eggs are bad. I would love to try your recipes. They sound very authentic. The best website so far that I have found for Pinoy recipes! Keep us salivating, Manny! Hi Tony, thanks for the kind words! I hope you will often visit this blog!